Night Buses are not running on New Year’s Eve tonight. Most trams and trains are running all night — and it’s more trains than last year; half-hourly after about 2am, rather than hourly as last year. There are also some regional trains and coaches after midnight. 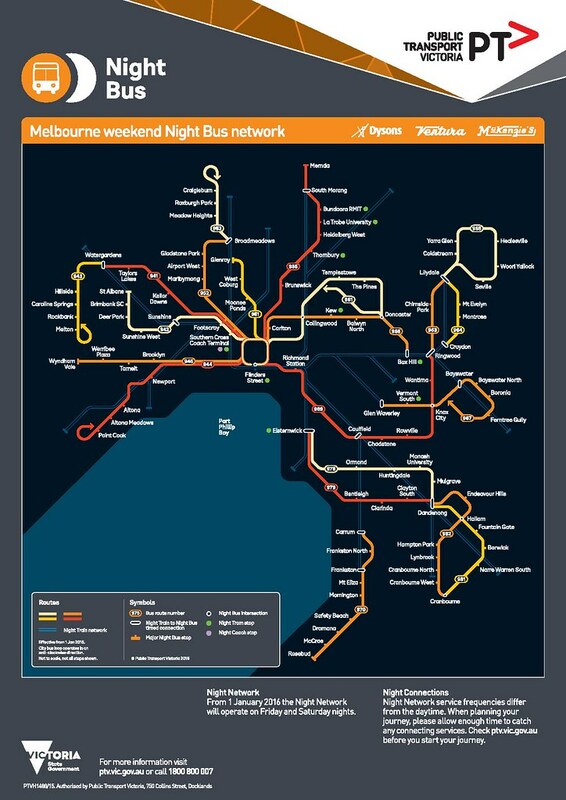 Night Bus routes are designed to fill the gaps between the trams and trains — especially the latter in the outer suburbs. 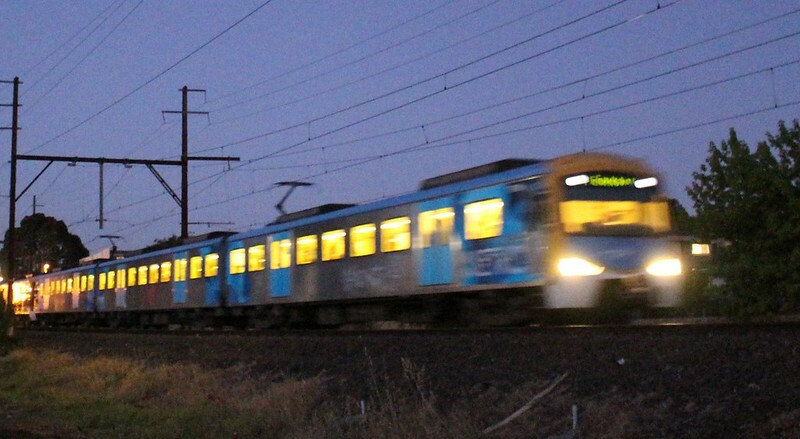 Not running them means many suburbs will have no public transport at all between about 10pm tonight and 7am tomorrow morning — including Mornington (and the rest of the Peninsula, population 155,000 people), Point Cook, Rowville, Mernda and others. Doncaster will have Smartbus routes extended until 2am, but nothing after that. Um, what? Trains and trams don’t run all night on Sundays either, but they do for New Year’s Eve. Why would you run the Night Buses every weekend, but not on the biggest night of the year? After they’d had some time to think about their response, PTV changed their tune to something a little more plausible: they claimed to journalists that only 50 people used Night Buses last NYE… but they also claimed that normal weekend Night Buses are “very popular”. Let’s assume the 50 people quoted excluded the Doncaster Night Buses. If that service was used by hardly any people, then this year they wouldn’t be running four Smartbus routes to Doncaster every 15 minutes until 2am. Doncaster aside, if Night Bus passenger numbers are low on NYE, logic would imply they’re even lower on most weekends. Does Night Bus need a re-design? Most of the time, official patronage figures for Night Bus are very hard to come by. But this claimed low patronage on NYE casts into doubt the entire Night Bus network design. If Night Bus patronage is not reaching expectations, then authorities should review the network, which currently is completely different to daytime bus routes, and partly duplicates rail services. On Night Buses specifically, one option would be running major routes (eg Smartbuses, or at least the busiest sections, and a few other bus routes targeted at gaps in the rest of the network) as 24 hour services on weekends and New Year’s Eve. Time them where possible to meet trains from the City. Like the 24 hour trains and trams, 24 hour buses would be more understandable for users, and more likely to get good patronage. The current Night Bus network of different routes to daytime means someone heading out before midnight but coming back after midnight has double the work to figure out how to use the system. Indeed, if Night Bus patronage is generally poor, and Night Train/Tram usage is more healthy, then we’ve got the ironic situation that the train/tram routes designed by the ALP in opposition are performing better than the bus routes designed by the professional transport planners at PTV. Keeping it simple is the key. After-midnight services should be (some of) the same routes that run in daytime, rather than a completely different network. Until Friday, Night Bus 970 (Carrum to Rosebud) was shown in PTV’s timetables and Journey Planner as running. They’ve finally fixed this, but at the time of writing, it’s still in Google Maps’ journey planner. PTV has also made numerous other errors in its Christmas/New Year information, as detailed by Craig Halsall in this 58-item-long (so far) Twitter thread. Nightrider also provided no service in many areas that have excellent daytime services, so some of the people most likely to use public transport didn’t have late services. Sunday trains started too late. Night Network kind of solved these issues, and with 35,000 extra trips every weekend, is getting people on board. But it isn’t perfect, and the cost has been huge, at around $80 million per year. The study into the timetables came about when it was pointed out to me that on some lines, the trains spend a lot of time sitting at the terminus. I wanted to find out how long. The Working Timetable, if you can get hold of it (it’s not currently online), shows which service the train goes to after reaching the end of the line. This made it fairly easy — except that the Belgrave and Lilydale lines do a complicated dance, with trains running from the city alternately to each, with shuttles filling in the gaps. It results in uneven frequencies (non-clockface times) in the evenings and on the Night Services. It could be fixed by running one of the branches from Ringwood as a shuttle, as happens on the Cranbourne, Alamein and Williamstown lines. Anyway, the results showed that yes, on some lines the trains spend an enormous amount of time sitting idle. Perhaps inevitable for the shuttles, but Sandringham trains spend as much time stopped as they do running; some Belgrave trains wait for an amazing 62 minutes before heading off again, and you’ll find trains sitting waiting at Craigieburn, Upfield and Hurstbridge for more than 40 minutes each hour. A big part of the problem is that the policy during the trial is for hourly trains. The idle time is far higher during hourly operation than before midnight with half-hourly services. Perhaps secondary is that the timetable may have been written in a hurry to get it implemented by the start of 2016. The Night Bus services still have the problem of a route structure that is completely different from day time — unlike the trains and trams (the half-dozen routes that run all night) which provide 24-hour service on weekends, which is much easier to understand.